"THE ROAD TO EL DORADO"
Like it's Disney rivals, this cartoon comedy is designed for a long life on video. Shouldn't lose much to the small screen. How Hollywood's animated filmmakers can continue to crank out pictures built on the same template year after year and have them continue to be even occasionally entertaining is something I'll never completely understand. But "The Road to El Dorado," a 100-percent formula cartoon adventure set against Cortes' arrival in the Yucatan, does it again. This one is about Tulio (Kevin Kline's voice) and Miguel (Kenneth Branagh), two-bit Spanish con men with a treasure map, caught as stowaways on the conquistador ship as it makes for the Americas in 1519. Late one night on the high seas they make their escape in a row boat and wash up on foreign shores. As the "Road To" title implies, Kline and Branagh are going for a Bob Hope-Bing Crosby rapport, so much comedic bickering ensues as they follow the map to El Dorado, an Aztec city of gold, where they're mistaken for gods and have to live up to the error while they organize a plan to go home with some riches. Comic relief animal sidekick? Check! We have two: A haughty war horse stolen from Cortes and an armadillo in El Dorado. Sassy, independent love interest with a killer cartoon bod? Check! Enter the voice of Rosie Perez -- turned down a few notches, thankfully -- as Chel, an Aztec girl looking to turn a little profit herself. Flirty, manipulative and super-curvy, she is far and away the sexiest cartoon hottie since Jessica Rabbit. Yowza! Antagonist with an evil, echoing, muah-ha-ha-ha laugh, supernatural powers and plans to overthrow a benevolent leader? Check! Armand Assante voices Tzekel-Kan, high priest of El Dorado, who at one point brings a two-story statue of a jaguar to life so it can chase our heroes around. Using "Pocahontas" as a template to begin the adventure -- and completely side-stepping the fact that Spain's arrival in Mexico brought mostly misery to the natives -- directors Don Paul and Eric "Bibo" Bergeron (who both jumped ship from Disney) manage to weave an adventure that inspires ear-to-ear grins, even if it's not terribly original. This is thanks in no small part to the quick-witted banter brought to life by Kline and Branagh, who bring the high spirits of two actors having a blast in the recording studio to their head-butting buddy characters. The script (by "Aladdin" scribes Ted Elliott and Terry Rossio) offers them plenty of comedic material as the two adventurers try to maintain their divinity charade. 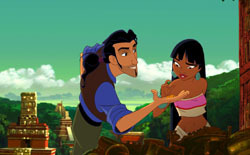 The animation is splendid, of course, seamlessly blending hand-drawn and computer-generated elements for a vivid depiction of El Dorado as a handsomely-appointed city of guilded step pyramids and lush vegetation. Dreamworks has yet to get past the notion that cartoons must be musicals, so "El Dorado" is engorged with overly-orchestral Elton John-Tim Rice ditties (sung by John, not by the characters), and that gets a little grating after a while. But if none of Hollywood's animation houses can find the courage to turn out something fresh in this genre -- save Warner Bros., who made last year's brilliantly original "Iron Giant" and got spanked for it at the box office -- at least some of them are occasionally finding ways to keep the formula as effervescent as "El Dorado."